Banking on the honourable management of talented and well-qualified professionals, we are highly immersed in offering an exceptional assortment of Industrial Epoxy Floor Coating Services to our customers. These services are used for providing chemical & abrasion resistant floor finish as well as for slip-resistant coating in wet areas. Service Available in- Coimbatore, Chennai, Kochi, Kerala, Pondicherry, Bangalore, Hyderabad, Vijayawada. 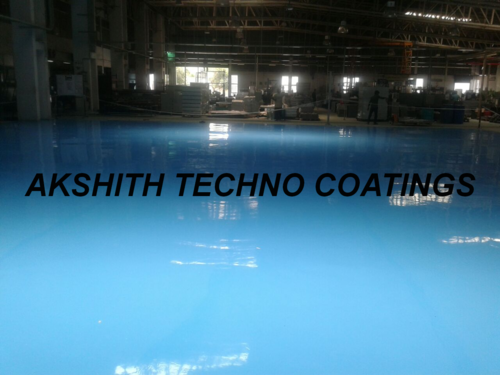 We, Akshith Techno Coatings, established in the year 2011, are considered to be among the prominent manufacturers and suppliers of a wide range of the premium quality of Surface Coatings Paints and Chemicals. The product range offered by us is inclusive of Epoxy Paints, Water Proofing Chemicals and Rust Converter Chemicals. Owing to their compositional accuracy, purity and longer pot life, these coating paints and chemicals are highly demanded in the market. In addition to this, we are one of the leading service providers of Surface Coating Services. To render these services within the assured time frame, we have appointed a team of skilled technicians and other supporting staff. Supported by a team of experienced professionals and state-of-the-art infrastructural facility, we have been able to meet the precise needs of our valuable customers in the most efficient manner. Keeping the ease of our customers in mind, we accept different modes of payment such as online, credit card and demand draft.